All online bookings are subject to review/approval and may be canceled should your reservation not be accepted. In addition, all properties are subject to availability, which may change at any time, and all rates quoted are also subject to change at any time. Some properties also have additional charges for extra guests or for stays of less than 7 nights, so please check with us prior to booking online if you will be over the normal occupancy or staying for less than 7 nights. If your required payment is a deposit, the balance of your full payment is due 60 days prior to your arrival date of your rental period. By authorizing payment via credit card you are authorizing Proctor Property Management to charge your credit card the balance of the total charges 60 days prior to the commencement date of your rental period. If you book your rental less than 60 days in advance of your stay, we will charge your full payment immediately by credit card or you must otherwise arrange for payment immediately or your reservation will not be accepted. If a balance payment is to be made, a confirmation notice will be sent to you via email to confirm receipt of payment. In lieu of a cash security deposit, we require a $60 Fee which is non-refundable. This fee protects you for up to $1,000.00 in any reported damages during your occupancy. However, damages must be reported to our office prior to your departure. Please report immediately to us, in writing, of any damage, loss or breakage. If Guest does not report damages that are subsequently discovered by Manager or Agent, Guest's credit card will be charged to return property to the same condition as when you arrived. Further Manager/Agent is hereby granted permission to process the credit card provided on the Authorization Form for any reported damages that exceed $1,000.00 and unreported damages up to $1,000.00. The credit card may also be used to pay for additional rent or necessary additional cleaning or trash removal. It is strongly recommended that Guests purchase travel insurance. You are a valued Guest and we want to do everything possible to make your trip enjoyable and worry free. Because the unforeseen and unexpected can occur before you leave or when you are away from home, we recommend CSA's Travel insurance. For more information on what this insurance covers please click here: http://www.vacationrentalinsurance.com/330csa. Reservations are for quiet residential vacation accommodations only. Therefore parties, receptions, events and gatherings of any kind are strictly prohibited. No additional people beyond the maximum occupancy of the house are allowed on the rental property at any one time. There is an Ordinance in Santa Fe which governs short term rentals and this Ordinance must be followed. The number of guests along with their names must be provided with the Short Term Rental Contract. Guest's reservation is accepted for one family or group of individuals for this accommodation only. 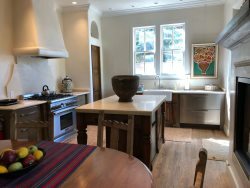 Guest's use of the rental is subject to local noise ordinances, governed by the Santa Fe Short Term Rental Ordinance. Noise complaints are subject to local law enforcement intervention. Law enforcement intervention will be deemed by Proctor Property Management a breach of this Agreement and may lead to cancellation. Quiet time is for all out door areas including yards, patios and portals. After 10 P.M. all activity must move indoors. The rental shall be in the same condition upon departure as at check-in, normal wear and tear excepted. Excessive cleaning will result in an extra fee. Guest shall be liable for all acts of the family, invitees, employees or other persons invited onto the rental property by Guest. Guest shall be responsible to return all keys and gate openers upon departure. Lost keys or remotes will be charged to the guest. Fee is $25 for lost or unreturned keys or the cost of changing the locks. Guest shall abide by the City of Santa Fe Short Term Ordinance, of the Owner and/or the Condominium Association. Guest shall not bring any pets into the rental or onto the rental property. Guest understands that Proctor Property Management cannot guarantee that adjacent properties will be free from disturbances and/or not be under construction, being repaired or maintained in any way. Construction on adjacent properties or construction conducted by the City, utility companies or road maintenance is not reason for termination of this agreement, nor is it a reason for the refund of any monies to Guest Equipment occasionally malfunctions and cannot be guaranteed 100% of the time. Agent will correct any problem(s) as soon as possible. An authorized repairman may enter the premises to repair such equipment. Refunds will not be issued due to malfunctioning equipment including internet access. This includes any closed amenity such as pools and hot tubs. Non Smoking Properties: All properties are non-smoking inside and outside. You are only able to smoke at least 25 feet away from any door or window opening and that of neighbor. If there is any evidence of smoking, you are responsible for the additional expenses for the restoration of the property. Lost or Stolen Items: Proctor Property Management is not responsible for any personal items which may be lost or stolen from your rental. Always lock all of the doors and windows when you leave the property. If you forget something, we can return it for a nominal handling fee. Guest understands that insects, rodents and bees/wasps may appear we are in the high desert mountains. Guest understands that owners make their best efforts to hold to an absolute minimum your interaction with these pests. Contact with a pest inside or outside of your rental is not reason for termination of this Agreement nor is it a reason for a refund of your monies. Please contact us immediately should you have a pest issue so that we can remedy it as quickly as possible. Any issues Guest has with the rental must be reported to Proctor Property Management in writing. Owner and Proctor Property Management have a reasonable amount of time to restore rental to acceptable conditions. Any issues presented after check out cannot be remedied and are not cause for compensation to Guest. We reserve the right to substitute comparable accommodations without liability should the unit become unavailable for any reason. When comparable accommodations are not available, Guest will have the option of selecting from available properties at the published rate or receiving a complete refund of the reservation deposit. Proctor Property Management acts only as an intermediary for the owners providing accommodations to Guest. Under no circumstances shall Proctor Property Management, managing agents, owners of rental, and/or their respective employees be responsible for any loss, expense, damages, claims or injury direct, indirect, consequential or otherwise whatsoever, caused or incurred whether arising in contract, or otherwise in law or equity as a result of rendering of the services or accommodations as described in this Policy or as a result of any delay(s), substitution(s), rescheduling(s) or change(s) in the services or accommodations arranged by Proctor Property Management. Further Proctor Property Management, managing agents, rental owners, and/or their respective employees shall not be responsible for any loss, expense, damages, claims or injury direct, indirect, consequential or otherwise caused by reason of acts of God, or by any agents, employees, subcontractors, servants or services as provided or substituted. Proctor Property Management at all times will act in good faith and use its best efforts when required to substitute with accommodations or services of a type comparable to those contracted. Proctor Property Management managing agents, rental owners, and/or their respective employees are not responsible for theft or damage of personal property and no refunds will be given for any such occurrences. The above rental information, while deemed reliable, is not guaranteed. Although every precaution is taken by Proctor Property Management errors in price and descriptions can inadvertently occur. Rates, descriptions and availability are subject to change without notice. Changes in bedding, furnishings, inventory, amenities, and or decor occur from time to time and such changes will not void or alter the terms of the rental and is not a valid reason for cancellation.